This is one those “there’s no way in hell that’s vegan” moments. THE MOST MOMENTOUS OF MOMENTS. It was a proud, proud moment when my carnivorous boyf and I first sank our teeth into this luscious, best ever vegan lasagna. The truth is that I’ve been making a version of this delicacy for years, and if you’re a loooooong time Hummusapien reader, you remember. My Skinny Vegan Lasagna straight outta the Dark Ages, of course! The photos in that blog post… I simply cannot. Then there were the Summer Vegetable Lasagna Rolls. Because isn’t everything more fun when it’s all portioned out? Now we’re back to the good ol’ casserole version. The old favorite. I don’t know how or why or where or when or what but the combination of garlic hummus and tofu and nutritional yeast is SO much like ricotta that it’s honestly bizarre. Uncanny. Bombastical. Like it tastes more like ricotta than ricotta does. Is that a thing? Many mouths have enjoyed (and that’s a vast understatement) this best vegan lasagna. I 100% guarantee that you could serve this to meat mongers and die-hard dairy fans and they would lick their plates! Aaaaaand ask for thirds. To make this epic lasagna, I use local Oasis roasted garlic hummus, an entire 40oz jar of my favorite Rao’s marinara from Costco (I love sauce! ), and either whole grain lasagna noodles or these lentil noodles, but there’s lots to play around with here. If your kids hate mushrooms or spinach, leave it out. If they won’t go within ten feet of anything whole grain, use regular noodles (or brown rice noodles for gluten-free!). Sadly, this vegan lasagna recipe will not work without tofu (I’ve had this press for years and it’s the best), hummus, and nutritional yeast. You can purchase nutritional yeast at most grocery stores in the natural section so I assume they have it at most other grocery chains. It really helps with that cheesy flavor, not to mention that’s it’s high in protein and energizing B vitamins. Do I Need to Pre-Boil the Noodles? Yes. I use whole grain lasagna noodles that I boil just until al dente. You can definitely use no-cook noodles like these to save time and skip boiling, just be sure to check the packaging to confirm. 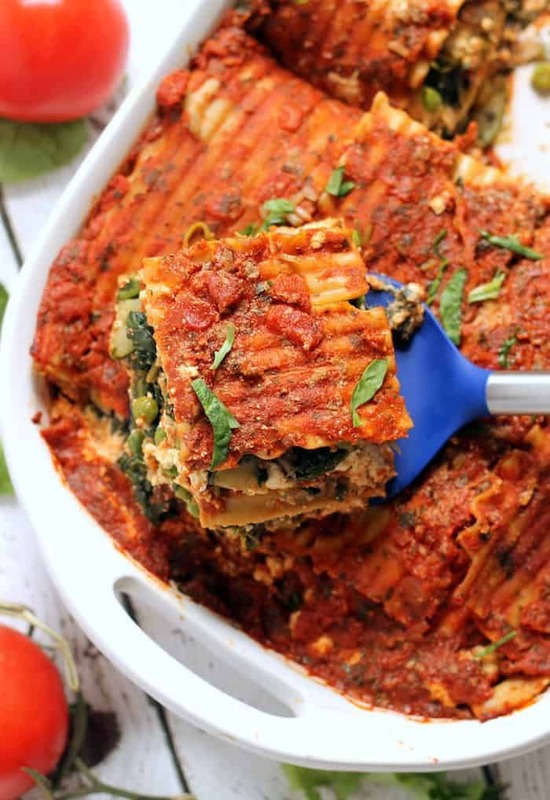 This Vegan Lasagna is Super Healthy! The nutrition stats on this best vegan lasagna are off the wall awesome. This is one HEALTHY lasagna! One big slice has a whopping 17 grams of protein, not to mention all the calcium from the tofu and filling fiber from the veggies and whole grain noodles. Plant-powered protein, oodles of veggies, and healthy fats—gang’s all here. ‘Tis the season of Spring thus the season of peas! I snuck some extra green into this gorgeous and super easy vegan lasagna but it tasted just as fantastic without them. I’m so, so, so freaking excited for you to try this! Please let me know how this vegan lasagna turns out for you by leaving a star rating and/or comment! I hope you adore it as much as I do. You’re literally a plant based recipe goddess. This looks insane and I totally just pinned! Can you make and bake ahead, stick in fridge, and reheat for dinner party 2 days later without compromising on taste and flavor ? Yes! I think it actually tastes better the next day. I have lost track of how many times I have made this recipe. It is so delicious. And I am no longer vegan! I am preparing this today for two vegan friends coming over for dinner tonight. This is my go-to lasagna recipe! Made this recipe last night with frozen artichoke broccoli and spinach! Soooooo freakin good! My boyfriend, who is not completely convinced on Vegan lifestyle is now one step closer to plant based options. He absolutely loved it. We like spice so I put some a little of our favorite spice “slab yo mama” in the tofu ricotta mixture. Thank you for this wonderful recepie, I loved the hummus in the tofu, turned out perfect. I just made this Easy Vegan Lasagna! It came out perfect. It taste delicious. I love the tofu ricotta. I added some dry sweet basil and dry tarragon to the spinach, zucchini, mushroom mix. I will definitely make this recipe again. Thank you for your post. Lasagna is one of my all-time favorite things to eat. This vegan version looks pretty incredible. Need to try! You’ll love it I swear!!! Can this lasagna be frozen? I’d like to make it. NOT bake it. Freeze. Take out for a holiday party in 6 weeks. What do you think? Hmmm I’ve never tried that. I would make the tofu ricotta and cook veggies ahead of time and then assemble before you bake. Hi there! Last week we made two. Ate one and froze one.second was successfully defrsted and deliciously reheated today . Planningg to do regularly. Yum! Did you bake it before freezing it? LOL, I love that your dairy-free magical mixture tastes more like ricotta than ricotta – I’m SO on board! Hummus + tofu + nutritional yeast?? Youuuu lil genius you! Lasagna is one of my favorite meals and I’m loving how veggie packed and healthful this is. You’ve got it going ON sista! I made a version of your lasagna roll ups a couple months ago and loved it! I didn’t try nutritional yeast though but now I can’t wait to! I love the addition to peas too, they are so high in protein for veggies! Can’t wait to give my bf the taste test! This is truly a work of art Alexis! Amazing recipe :) I love the usage of tofu for that “cheesy” texture. it looks truly delicious! i will have to make hummus ricotta very very soon! OMG fabulous recipe. Must share with my Mom who will love it. i love your lasagna recipe! it’s something i haven’t made in ages but something i definitely must. such delicious photos too. Love the idea of including hummus in the tofu ricotta! I have made tofu ricotta many times but never thought of including hummus, and I absolutely love hummus! I will definitely have to try this! I already know that this lasagna will be a favorite at our home! I think I died and went to vegan heaven. I remember the first time I made your tofu ricotta spaghetti casserole – I literally could not stop eating the ricotta plain. Making this nomtastical lasagna ASAP. Have to try that tofu ricotta trick!! Yum, Winter has arrived in my part of world and this lasagne was perfect for a cool evening. Love that it was packed full if nutrients. I’ll be making this again. I’m so glad you enjoyed it! Thanks, Kathy! Thanks a ton! This a impressive web page!. Yayy!! It’s my FAVE! You should try the Baked Spaghetti with Tofu Ricotta next! I will print this one and try it soon. I am loving my transition to veggie menus. Amazing! Thanks for reading and keep lovin’ dem veggies. Does this freeze well? Also, how are the leftovers? OH MY GOD this was sooooo good! I am not vegan but I like to tinker with vegan recipes and MAN this was so rewarding. Honestly delicious and my boyfriend, who is quite the carnivore, really liked it and got seconds. Thank you so much for this recipe, I will definitely be making this on a regular rotation!!! I made this tonight. OH. MY. GOD. It is the best lasagna that I have ever had. I loved the vegan ricotta. It all came together so beautifully. AMAZING. So glad I found this recipe. It was great! My fiancé took it to lunch yesterday and told me just now that it was amazing – good to get him eating vegan!! thanks so much! 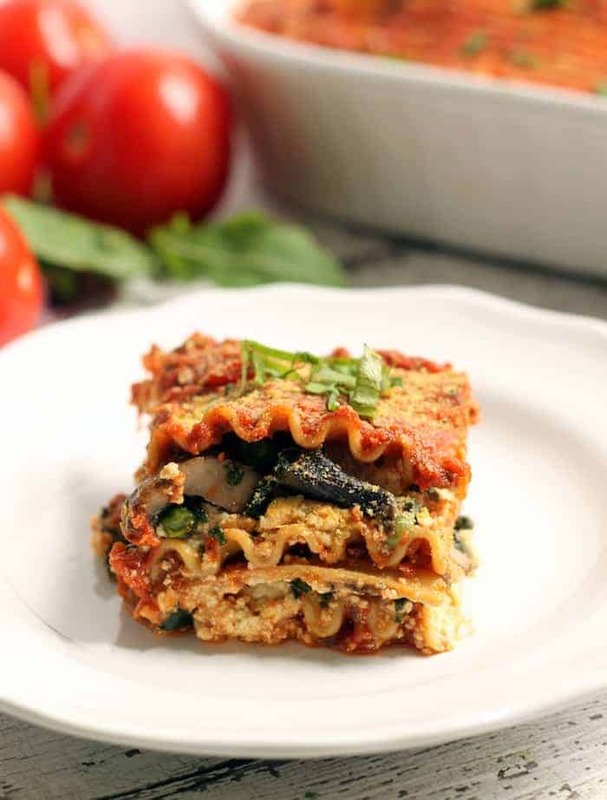 I just found your site today searching for vegan lasagna- this looks amazing, I’m going to make it tonight for dinner – thank you so much for sharing! I am making this on Thursday. Can’t wait!! I made the lasagna for dinner last night. SOOOO GOOD. Yayyy!! I just bought the ingredients to make it this weekend :) So glad you liked it! Recently I have been on a quest for vegetarian lasagna ideas. This one sounds good tasting but cannot support it as healthy. First I would never use tofu. In case you haven’t kept abreast, soy is not a healthy food stuff, particularly if it is not fermented. Much information available for you to read on this. Several good articles on Mercola.com and most like Green Medicine as well as other places of considerable validity. Second, the noodles are clearly not Paleo so I hope you are not implying they are. For people trying to cut sugar, these noodles are big carbs. All grains break down to sugar in the body. What I can suggest positively is to make a mushroom cream sauce instead of tofu. I don’t use cashews because of the cost but they are quite good to use as you do. I am interested in experimenting with some coconut flour or other seed flours and would consider adding olive oil for richness. I have invested recently in a mandolin that can slice 1/2″ pieces of eggplant or other veggies to use instead of noodles. They work beautifully with the homemade tomato sauce and whatever green veggie of choice. I personally like the bitter green like mustard, or turnip, but kale or chard work equally well. I tend to sauté the greens with onion and garlic and what ever other spices within arms reach. It seems important to me that one not call foods that promote sugar increase in the body as healthy even if they taste good–we were all raised to be sugar addicts. And please don’t promote soy as healthy–this was a major marketing push by Big Ag looking to promote the highly disastrous concept of mono-culture in this country and had nothing to do with health. The concept of the Japanese eating tofu is also mythological as they don’t eat it except in very small amounts and usually fermented as in tamari or miso or natto. Big Ag pushed eating 4-8 oz/daily to sell this noxious stuff. And today about 95% of it is GMO which should clearly be a big NO, NO when creating recipes. Hope you will consider these thoughts as you produce your culinary delights. Hey there, Tanya! I appreciate the time you took to write a thoughtful comment; however I have to respectfully disagree. You can find thousands of articles on the internet demonizing soy for mimicking estrogen and just as many supporting soy for the anti-cancer properties and antioxidant capacity of of its bioactive compound, isoflavones. You can also find a million articles on hotly debated foods like dairy, meat, sugar, grains, and pretty much every other food there is (perhaps besides kale, but even with that you’ll find research on oxalates.) When it comes to soy, my beliefs as a registered dietitian with a masters degree in nutrition are of the latter. I’ve spent a lot of time researching soy. Contrary to popular belief, research shows that soy actually protects against breast cancer, along with prostate cancer and heart disease. The phytochemicals in soy reduce inflammation and prevent the activation of proteins that promote cell growth commonly seen with these cancers (https://www.ncbi.nlm.nih.gov/pmc/articles/PMC2981011/). Research shows that soy may also provide relief from menopausal symptoms. I fully support the notion that eating organic whole food sources of soy a couple times a week is completely safe. I’m not advocating that my readers replace their lunch every day with tofu, and if you look at my recipe archives, they largely contain recipes with other sources of plant-based proteins. I’m simply providing a healthy, dairy-free version of lasagna that tastes just like the original. And yes, fermented soy like tempeh and miso are even better than tofu. I’m not advising my readers to buy frozen veggie burgers and protein bars made with soy protein isolate. Regarding the noodles, they are of course not paleo as they are grains. Regarding sweeteners, I advise my clients and readers to use less processed sweeteners in smaller amounts (maple syrup, coconut sugar, raw honey, etc.) and also firmly believe in balance–a life without indulging here and there is no life I want to live. Dr. Mercola recently wrote an article titled “Worrying About Your Health Can Make You Sick.” He goes on to say that “being neurotic can double your risk of Alzheimer’s.” Using fear mongering (demonizing all sugar, grains, soy, really anything) to encourage people to eat healthier is NOT my style. Thanks again for reading! So glad you replied kindly to her lengthy comment with your evidence based, professional and balanced opinion. You promote healthy eating , healthy thinking! I am also a dietitian and came across this recipe today after making some homemade pasta and thinking…hey! I should make lasagna for dinner! I’ll be trying this one out for sure. I also want to agree with the Pam’s previous comment. As nutrition professionals, it is so important to share evidence based nutrition information in a respectful way. I agree wholeheartedly with your response and am happy to hear there are other RDs out there who believe in the goodness and power of vegetarian/vegan protein sources and whole food eating! Keep doing what you’re doing! Thanks so much, Lindsey! I can’t lie…that comment REALLY aggravated me. It reminded me how twisted people in this society think of food and how real food mongering and orthorexia are. It’s scary…but that’s what we’re here for! Thanks, Pam :) I tried my hardest to be kind when I really, really wanted to freak out!! I just want the fear mongering with food to stop. Can I make this the day before and than cook it? As a retired Dietetic Technician, Registered, I also appreciated the thoughtful and balanced, evidenced based reply Alexis gave. As a nutrition grad student, I absolutely loved reading your respectful yet informative and evidence backed response. Especially in this day and age of our country, it is so important that we use our nutritional knowledge powers for good and for proper and respectful education. This was a 5 star response in that! Thank you for helping to show me a positive way to put that while still remaining firm in the science and not in the drama. I appreciated reading this! Also, I can’t WAIT to make this lasagna this week!!! At my food service rotation today, everyone taste tested a delicious smelling lasagna so I have been craving a vegan version ever since. Nom! Can this be made a day or two ahead of time and than baked? Thank You. I just did that the other day. Assembled it on a Sunday and baked it on Monday. I was worried that it would be too mushy, but it turned out fine. The only difference was b/c it came out of the fridge, the cook time increased – instead of 30 min, it took about 50 to get things bubbling. Hi There! I made my mom’s recipe for veggie lasagna, the best comfort food in z land, and used your vegan ricotta instructions from this recipe for the ricotta filling. It was delish! The Bf mowed it down and couldn’t even tell it was not whole milk ricotta! Thanks again for the inspiration! Making meals healthier, one ingredient at a time! I just assembled the Easy Vegan Lasagna for Christmas Dinner! Can I place it in the fridge for a day and cook it on Christmas Day? We are very excited to make this our center piece! Even the meat eaters loved it!! They were like “this is what tofu tastes like? Its GOOD!”…Awesome recipe!! I absolutely love this recipe! It’s my go to when I want something easy to make for supper after work. I have even made it for my meat loving coworkers and they love it! Thank you so much for the recipe! I’ve made this for my meat eating now fiance and lactose intolerant best friend several times and they still ask for it again and again. Love enjoying lasagna and knowing it’s loaded with nutrition. Incredible! Food that is enjoyed by meat eaters and non-meat eaters alike is the best food. Made the vegan lasagna for a vegan dinner guest and it was quite good, but the prep and cooking times were off. Way more than 15 minutes prep to sautée ‎, mix, and assemble and the cooking time at 350 to serve cooked through and hot was closer to 50 minutes. I had a similar experience., when it came to the cooking time. I’m heading towards the 50 minute mark as I type. Other than that, my wife and I can’t wait to devour it!! Interesting! Did you cook the noodles before hand? This recipe was amazing! I’m a carnivore but was looking for a lasagna recipe that would accomadate my daughters many food allergies. I used brown rice lasagna noodles instead and put a whole head of roasted garlic in the “ricotta” mixture because I had plain hummus. The only upsetting thing was that I had somewhere to go and couldn’t stay home for seconds. Thank you so much for this great recipe! I will have to try your other recipes. I LOVE your swaps and substitutions! So happy that you and your family enjoyed it :) It’s seriously a staple in my house. AMAZING!!! Not only did my very picky kids eat this, my omni husband (who never ever likes anything that I make that is plant based) loved it as well! I will be putting this into heavy rotation and making for holidays and entertaining. This is literally so amazing. Everyone who I’ve made it for lauds me as this incredible cook and when I say I was just following this recipe they ask me to send it to them. My sister is a huge cheese eater, but was OBSESSED with the tofu ricotta. My friend hates hommus, but still loved it. It always takes me quite a long time to make, but I am very bad at following recipes and it still tastes delicious with me mucking everything up half the time. Definitely recommend. This is amazing!! I’m so happy you’ve found it and keep on making it. Eat on! Awwww you made my day!! Isn’t it so dreamy? I’m making this right now but a twist on the sauce, I’m adding tomato sauce, diced Italian tomatoes, a bit of tomato paste and a cup of TVP. I bet my husband won’t even know it’s vegan!!! Yay!! Hope you both adore it! This is very good. I used fresh baby spinach and fresh minced garlic. I was amazed at how the hummus and tofu so perfectly imitated ricotta. I did use the peas. Will be on my saved recipes list. I have made this twice now! Thank you so much for the amazing recipe. :) Definitely a new favorite. Yay!! We make it pretty much every other week rotating with the baked spaghetti :) addicted! Just made this for my carnivore dad and cheese-obsessed boyfriend… They absolutely loved it! Second helpings all round! Only changes I made were I used fresh spinach and I couldn’t find garlic hummus so I used caramelised onion hummus instead, which worked really nicely. Seriously this was so delicious I could not recommend it more highly, for both vegans and non-vegans! It was super easy to make, but very impressive at the same time! I’m going to be making this all the time! Thank you so much for this gorgeous recipe! This brings me such joy! I love it when our carnivorous friends love a plant based meal so much :) Happy Friday! We had the lasagna this evening–it was stupendous! Thanks so much. I would like permission to reprint the recipe in my free online journal The Peaceable Table, http://www.vegetarianfriends.net/html . We will of course give you credit and give the link to your website. Hey there, thanks so much! I’m thrilled you enjoyed it. Unfortunately I don’t allow my recipes to be re-printed. You can send out the link to the recipe but please don’t re-post the recipe. Thanks! I don’t know what took me so long, but I FINALLY made this on Sunday night and oh my it’s delicious!! My carnivorous, dairy-loving husband loved it, too. I’m so happy to be eating leftovers ALL week! Your vegan lasagna recipe was the best!! I made it for my mom’s birthday. I made vegan, vegetarian and meat lasagna….i was told the vegan was the best. I only ate your recipe ?. It is such a good base for a vegan lasagna …using any veggies and any faux meats. Thank you for sharing! Sometimes I feel like vegan cooks have so many secrets so I am truly thankful that you shared this gem of recipe. Fantastic! I subbed grilled zucchini that I put through a mandolin slicer for a gluten free version and everyone at the retreat center I am staying at loved it. Will totally make this again. Thanks for the great recipe! I made this lasagna over the weekend and it was amazing! I did not think tofu and hummus was going to work but it was so good I shared it with my non vegan friends and they liked it! This will become a regular at my home. Wow! This tasted great! My sisters are always trying to eat vegan foods since we looked into a healthier alternative for pretty much everything. We’ve been wanting to make lasagna for a long time now but find a way to do it without cheese. This was just perfect and my family loves it. It was light and the cheese ricotta tastes just like cheese except healthier and better. I will make this dish again for my friends in the future. Thank you. We just cut it and it’s so good, I’m telling everyone about this! Oh my, this is so good. Never would have thought about putting hummus in lasagna. This is my all time favorite lasagna recipe. It’s so filling. I used clasico fire roasted tomato and garlic sauce, safeway organic roasted garlic hummus. The only mods were added fresh cracked pepper, regular lasagna noodles, and an extra 2 ounce of spinach to use up the whole bag. So good. THIS WAS AMAZING. I never take the time to comment on blogs, but this dish even impressed my carnivore best friend (I didn’t tell him it was vegan until after he ate it). My mom and dad loved it and my boyfriend ate all the leftovers by the next day. The “ricotta” is phenomenal.. Seriously. Make this. I made the lasagna last night next to the traditional lasagna for my ultimate meat eating family. I was not disappointed! I switched out the noodles for eggplant. I have been a vegan for a total of 4 days? This is a great recipe for those who miss cheese. I didn’t even regret not eating the traditional dish! This looks amazing, I will definitely be making this soon! Question: can you use no-boil noodles? I’ve never made vegan lasagna, so just wondering if they will work the same without the moisture from ricotta . Thanks! Hey there! If you use no boil noodles, the cook time will be a lot shorter. Hope that helps! Absolutely amazing! Made it last night for the fam (2 vegans, 1 vegetarian,2 meat eaters) and we all had clean plates! That vegan ricotta will be on my go to list from here on. I had some left over and actually going to try as a hot dip at todays pool party! Thanks- you have a new fan with me- going to subscribe to you blog! This lasagna recipe looks amazing! Planning to make this for our friends who are coming over after church on Sunday. Would it be possible to prep it and cook it in the slow cooker in the morning while we’re out of the house? Excited to check out the rest of your recipes!!! How about I seriously cannot stop eating the ricotta as I’m making it. Even my meat eating gremlins keep taking spoonfuls. Can’t wait to dig into this ? Can you make this ahead and freeze it? Love it ! I wish someone could answer this question. I love this lasagna recipe and would love to add it to my Thanksgiving table. Anyone? Hey Valerie! I’ve never tried freezing it but I’m guessing it could work? You’d of course have to cook it longer. I’d do some googling and if you find other people freezing lasagnas, you should be fine. My only concern is the ricotta drying out since tofu looses moisture when frozen. Oh my god. The BEST lasagne I’ve ever had. Love this recipe so much. Tonight I’m making it for my non vegan father and i just no he’s gonna love it..
Let me just preface this by saying- I absolutely hate lasagna. But my meat-eater boyfriend was craving it for dinner so I decided to try it. When searching for recipes, this one was the most appetizing looking and easiest to prepare. OMG it was SO good!!!! He looked at me and said this was the best meal I’ve ever made him (he’s not a fan of nooch, but didn’t even notice it) It wasn’t soggy like most lasagnas can be and had a great variety of textures. I will definitely be making this again- we both went in for seconds. SO GOOD!!! I’ve made this twice in the past 2 weeks. Once as a tester for my husband. I asked him to guess what the “ricotta” mixture was substituted for. He never guessed it was hummus and tofu. He like it so much, he suggested I make it for a dinner party we had last night. I added roasted peppers to the veggie layer. Super good! Thanks for the awesome recipes! Mmmm roasted red peppers sound fantastic. Can’t wait to try that! Wow, and I mean WOW. I’m not vegan, but I’m highly lactose-intolerant and can’t have ricotta or mozzarella. I’ve missed lasagna dearly, so I decided to give this recipe a shot and I can’t believe how delicious it is! Thank you for bringing lasagna back into my life. I made this tonight and it was fantastic! Easy and delicious! Thank you! I know I will make it many more times! I’ve made this twice already (with some of my own variations!) and the family loves it! I’m the only vegan in the household so when I cook something they love AND it’s vegan it’s a double win for me! I would like to say that I have a large amount of the tofu mixture left. I tried using more of it the second time I made it but still ended up with a large amount left. I’d recommend only using one package of the tofu and not 2. That being said, do you think it’s possible to freeze the reminding tofu for future use? I made it on Tues and will be making another lasagna next Saturday (11days) so I assume it won’t be good anymore if keptnin fridge. I’m not sure if it will get too watery if I freeze and then thaw. Suggestions? “It’s pretty damn close to ricotta” says my meat and dairy loving husband.. So good! Used artichoke hearts, spinach, broccoli, and mushrooms and it turned out fantastic! (Also used a LOT of sauce haha) great recipe! I’m super excited to give this recipe a try! I’m usually super busy so do you think this could work in a slow cooker? I have nooo idea sorry, never tried it! Can you prep this the day before, put it in the refrigerator, and just pop it in the oven the next day? This is on our Christmas menu this year, so I’m hoping I can prep it on Christmas Eve! Should you squeeze out all of the liquid from the frozen spinach and tofu first? You’re so kind, Caitlin! That means so much to me. Thank you! This is the third time I’ve made this lasagna and it is so fantastic. My whole family loves it. My meat loving teenage sons love it. It is comfort food but you feel light and healthy afterwards. Thanks for a great recipe! Hooray for no knife skills! I’m so happy to hear you loved it. This recipe will please any carnivore!!! Delicious, easy recipe… I love that the knife skill requirement approaches zero! It is a busy dish to prepare, but reheats really well if you make ahead too. I’ll be making this again (and again)! I’m a confirmed carnivore and hunter, but I’ve travelled alot and come from a long line of chefs, so love all kinds of food. My recently acquired step-daughter is vegetarian but, like many teenagers, thinks that means you can just eat peanut butter and ramen noodles. I’ve been trying to teach her to cook healthy vegetarian, at least. When she brought me this recipe I was happy to help her make it. All I can say is “WOW”. It’s that good. We just made our second batch tonight. We made a couple slight modifications – added some textured vegetable protein to the tofu/hummus mix for a meatier texture (and more protein), sliced the zucchini and mushrooms on a mandolin (makes for better layering) and I found the 30 min. cook time left the zuchini undercooked. 45-50 was much better. Thanks for a great recipe! I’ve shared it with a number of colleagues and friends. Wow–how awesome is that story? I’m so glad you and your step daughter can bond over this yumminess! I’ve tried vegan recipes and failed so many times. Finally found one that hasn’t failed!! Deeeelicioussss!! Thank you for posting this! Yesssss hooray for no more failures! OMG! I made this for dinner last night. It is AMAZING!!! So glad it makes a huge dish because I want to eat this every day LOL!! This lasagna was amazing!!! The ricotta cheese mixture is genius! Could not tell the difference and so yummy! I used spicey hummus and it really gave it a nice flavor. Also I sauteed onions and garlic with my veggies, used broccoli instead of peas, and added some pesto to my marinara sauce and it tasted soooooo good! Will definitely be making this again! Ohhhh spicy hummus, what an amazing idea! This just changed my life! I’m obsessed. Best comment ever! Thank you so much! I’ve been a vegan for several years now, vegetarian even longer. I’ve probably made this recipe at least 10 times now and thought I would post a thank you for creating such a fabulous lasagna. It really is so good. I tweak it by adding minced garlic into the oil before cooking the mushrooms and zucchini. Also, I add a big handful of sliced Calmata olives into the ricotta. It’s a family favorite! Omg that sounds so good! Thank you so much! How long is this good in fridge for, do you think? I actually halved this for my mom and I and wow…I’m mad I took so long to finally make it. It’s amazing! I loved the tofu ricotta in your baked spaghetti recipe. II’m not vegan, but it’s incredibly convincing and we both loved how light (but filling) this recipe is. I use Rao’s Roasted Garlic sauce. Yum! Thanks so much for the recipe–I will definitely be making this again! My husband absolutely loved this lasagna! He said it’s the best he’s ever had. The “ricotta” is pure magic. The only thing I will change next time is I’m going to add more veggies and mushrooms. Also let me know what I can do to make it 5 stars! You’re so welcome! We make it ALLLLL THE TIME. Thank you for this recipe!! I haven’t made lasagna in years but this one looked totally do-able. I included riced broccoli instead of peas & added some balsamic to the veggies while sauteing. We have gluten and casein allergies so my wife suggested polenta. I cut it supper thin and layered it like the noodles. I made a meat sauce (we have no allergies to that) but layered in artichoke. Peas. Mushroom. Spinach. And zucchini). It was badass. My 14 yr old son wants me to make it every week now. Punched up the spices a bit too. More garlic and I ground the fennel seed but basically the same. Hey, Tara! You do need the hummus as it provides flavor and moisture. You should definitely be able to find a tahini-free hummus. I think Trader Joe’s has one! If you can’t find one, I’d make your own at hummus at home with chickpeas, olive oil, lemon, garlic, and salt ? I made this last night and it was a huge hit! Brilliant idea to use the hummus in with the tofu. I like it with lots of sauce too and this had the perfect texture and flavor. Holy sh$%#, this is awesome! I have missed lasagna so much, and always so afraid to try a vegan version. But this is quick, vegan and amazing!! I don’t know how you did it, but thank you! This is now my one and only. It absolutely rivals a meat version or any vegetarian version, no cheese needed! Wahoo! Best news ever!! So happy it made all your wildest lasagna dreams come true. I made this last night for my boyfriend and kids. They loved it and actually opted to eat it instead of the meat version he had bought from the supermarket. This is THE FIRST TIME I have ever made tofu taste good!!! (and I’ve been meat free for over 30 years). I’m excited. Proud, and ready for the next venture. I didn’t make the sauce from scratch, because I was in a hurry, but even with jarred sauce (which I drained the liquid from) this was a hit. Today = leftovers for lunch! This was simply amazing. I prepared exactly as written omitting the peas (didn’t have) and adding lots of fresh basil to the cheese mixture. Surpassed my expectations and will keep on my regular rotation. Not worried about freezing any of it…I’ll eat it till is gone. :-) Thanks for a great & simple recipe. This lasagna was delicious!!! It was also very straight forward to make for a lasagna! Absolutely loved it and my meat eating husband really enjoyed it too. I followed the recipe exactly and used whole grain rice noodles (cooked them slightly beforehand). I also used lots of sauce per the suggestion! Not in the recipe, but I topped the lasagna with earth island “mozzarella cheez” and while not overly healthy, it was a delish addition!!!! Thanks for this recipe that I will absolutely use again! Yessss thanks so much, Baylie! If you’d be so kind as to leave a star rating I’d be so grateful. Thanks for commenting! In the ingredients there is stated that I need from 2 to 14 oz tofu. The amount depends on what? It means 2 packages of tofu, so about 28oz total. Yummly lists 1 pkg tofu but your recipe says 2. I’m confused. Daughter loves it but not sure which qty is right. 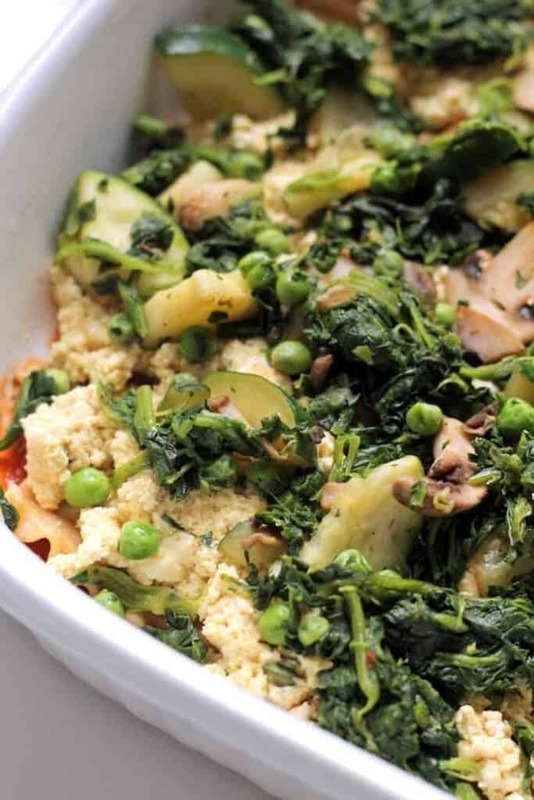 Even the non-vegans loved this recipe at my night-before-Earth-Day Green Dinner! Thank you so much! I’m not vegan, but I’ve wanted to master a few very satisfying vegan dishes so my vegan friends can easily be included at dinner gatherings. Not being experienced at cooking with tofu, I wish you would have mentioned that THE PRESSING AND DRAINING OF TOFU IS NOT INCLUDED IN THE PREP TIME! Good thing I prepped the veggie mixture and the ‘ricotta’ the night before. Assembling the lasagna took about 15 minutes the night of the dinner, so it all worked out – all the time was worth it. I’m anxious to see how the portion I froze holds up once defrosted. I’ll let you know! So glad you liked it, Tara! I usually drain and press for about 20 minutes while I get the other ingredients out and sauté the veggies. Even if you press it between paper towels for a couple minutes, it’ll still turn out just fine. Shouldn’t add to the prep time very much! One of my favorite vegan recipes. Even when I was eating dairy I avoided making lasagna because all that cheese is really expensive (I live in NYC). This is super-delicious. I’m posting because last night a friend who’s staying with us wanted to cook us dinner and I requested this recipe – he’s a meat-a-holic and I think it opened his eyes a little bit to the possibilities of vegan cooking. Thanks for sharing! First, thank you so much for sharing this recipe. I’ve been looking for a good vegan lasagna. I’m not a vegetarian but my wife is allergic to dairy and doesn’t like the fake-cheese substitutes I’ve used previously. Cashew cream, a staple in so many vegan lasagnas, is also out due to allergies in one of my kids. I love love love this recipe. I don’t even know what to say. I made it for the first time last night. My kids thought I was crazy when they watched me make the tofu ricotta. But they eagerly gobbled it down once I put the finished product on the table. We have leftovers for tonight. I don’t even like leftovers, but right now I am sneaking a “bonus” slice for myself before dinner (sorry family!). I will be sad when our lasagna pan is empty after Tuesday night dinner. I have a question for you: I don’t have a big repertoire of “go- to” vegan recipes. Your lasagna is going to the top of the list. Can you kindly tell me what are some other good “gateway” recipes for non-vegans on your blog? This is so delicious and even great warmed up the next day. I would however add more of the veggies and cut down on the tofu slightly to make a nice balance. Oh this looks PERFECT. I used to ADORE lasagna as a kid. I miss it now, so I can remake it again with this recipe! I NEVER comment on recipes…. And have made so MANY recipes that I would NEVER repeat, because they were disgusting……. I was starting to get discouraged with this way of eating…… BUT THIS LASAGNA ROCKED OUR WORLD!!!!!! I just had to follow you and THANK YOU for a meal I will be making over and over again!!!! I was beginning to think it wasn’t possible to have a delicious one dish meal which I LOVE to make in the mornings and eat for dinner… It was SERIOSLY DELICIOUS… Thank you again!!! I cant wait to scour your site for more yummy recipes to try!!!!!! Awwww your comment made my day! Thank YOU so much, Brenda! I just made this. It’s pretty good. I am a meat eater and I really liked this meal. My wife is a vegetarian and loved it. Thanks a lot ! So glad. My meat-eating boyfriend loves it too! Hi there!! I was wondering – if you’ve tried this recipe with uncooked lasagne sheets? Or is cooking them before using them totally necessary? Hi! You can use no-boil noodles that don’t require cooking but if they’re regular lasagna noodles, they definitely need to be cooked ahead of time. Enjoy! Ive never frozen it but honestly I freeze anything and everything so give it a go! Hope it works! Hey Alexis, I was kind of wondering because I noticed a comment about you chatting about calories with a different reader. The reader asked about a discrepancy in calorie calculation, which you seemed to be encouraging counting every calorie in an obviously healthful recipe. She said, “If it’s 220 then it’ll leave room for seconds.” Last I checked, IE principles dictate that your internal hunger cues command you to stop, not a silly number. I’d appreciate you shedding some light on this seemingly disordered behavior. Hey there, Celeste. I’m guessing the comment you’re referring to wasn’t recent? I wrote that post over 2 years ago, well before I transitioned to promoting intuitive eating in 2017. I’ve never tried it—I think the tofu ricotta is the star of the recipe :) but any ricotta with dairy or without I’d assume would work fine. This was outstanding!! Even my picky four year old loved it! I skipped the peas (personal preference) and cooked it about 15 minutes longer than called for in the recipe, and it was perfect. I will absolutely be making the again. I just stopped by to say that this lasagna is INCREDIBLE! I’m about to make it for the second time to serve at Thanksgiving; the last time I made it my family raved about it, and I was in love from first bite! Thank you for the great recipe ? I did this for my son’s student film crew, I also made a meat lasagne too. some of the crew had both lasagnes and declared this one to be better than the meat one! It tastes so full, you do not miss the meat or the cheese, it is delicious! made this for my vegan son last christmas and he LOVED it. thank . you! quick quest..
want to make it ahead of time this year .. can I freeze it?? I appreciate your well thought out info. Made this for dinner tonight, and it was amazing! Who would have thought tofu and hummus make an insane ricotta! Even Omni husband liked it! I made this about one year ago and absolutely loved it. I was so happy when I searched for it again and found it! I will not misplace this recipe again! Delicious! This was an incredible recipe. Such simple ingredients but so flavorful. I’ve been trying to eat more plant based and with recipes like this it makes it so easy!! I have no words because my mouth is full with this AMAZING lasagna! ????? I made this last week and took it church knowing I’d be able to bring most of it home to freeze since my husband and I are the only non animal eaters. And I was wrong. Everyone loved it! A week later, we’re celebrating my husband’s birthday and he requested? You guessed it! But I forgot to pin the recipe. I’m just so glad I found it again. Thank you for this amazing recipe. Everything about it is spectacular! Awww the ultimate compliment! Thank you TONS for the wonderful feedback and star rating, Joanne.